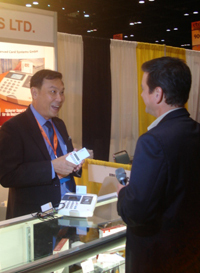 ACS Hong Kong, 2 Jun 2008– Advanced Card Systems Ltd. (HONG KONG STOCK Exchange: 8210, www.acs.com.hk), Asia Pacific's number one supplier in PC-linked smart card readers industry (Source: research report issued by Frost & Sullivan), was interviewed by Chris Corum, Executive Editor from AVISIAN Publications, the leading media group in smart card industry. During the interview, Keng Boon Tan, Chief Tehnical Officer of ACS, introduced some new products and some successful cases. Besides ACR128 Dualboost smart card reader, APG82 One-time password (OTP) reader, ACR83 PINeasy smart card reader and eH880 Secure smart card terminal, he particularly stressed the ACR122 NFC contactless smart card reader. For further details of ACR122, please visit http://www.acs.com.hk/acr122.php. Advanced Card Systems Ltd. (ACS, Hong Kong Stock Exchange: 8210), founded in 1995, Asia Pacific's top supplier of PC-linked smart card readers (Source: Research Report issued by Frost & Sullivan) is one of a select group of global companies at the forefront of the smart card revolution. ACS develops, and distributes a wide range of high quality smart card reading/writing devices, smart cards, and related security products to over 100 countries worldwide, facilitating an easier adoption of smart card applications in different industries. Visit ACS at www.acs.com.hk.